A campus is a single campus or facility that your members may bring their children to. For example, if you have 3 different facilities spread across a region, you will have 3 different campuses. Examples of a Campus name may be “Main Campus”, “West Campus”, “Downtown Campus”, etc. A location is a place within a campus that guardians can check their kids in and out of. This can be a classroom, a class name, etc. Example of a location may be “Nursery (Room 102)” or “First Grade Boys”, etc. Select the System Settings gear icon in the upper right corner, and then click on the System Options item in the left sidebar. In the Campuses & Locations area, click on Add New Campus to create a new campus. Enter in all the information about this campus, including main phone number, address and primary contact person for this campus. Note: Creating multiple campuses is only available on Standard Edition and above, and is dependent on the number of licenses you pay for. 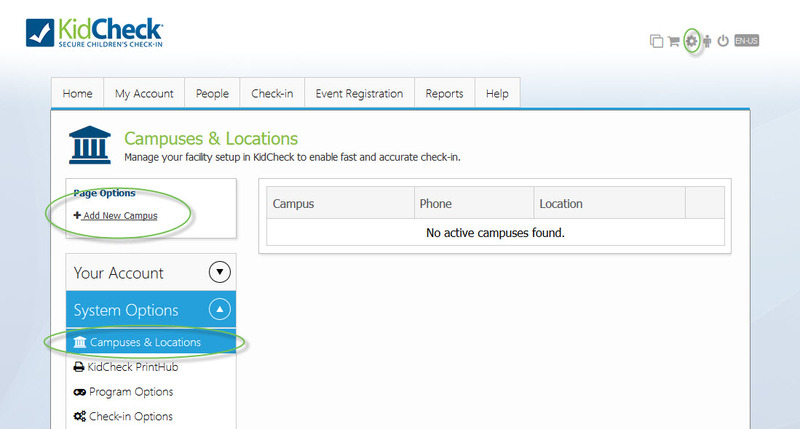 To create a location within a campus, click on the name of the appropriate campus, and then click on the Add New Location or Age Group button. Within each campus, you’ll want to create a master library of all locations to be used at this campus. Even if the locations are used at different times throughout the week, add them all in here (they will be divided into templates/programs later). The amount of detail you include in choosing your location names is very important, both in terms of making check-in seamless for parents, and for the accuracy of your attendance reports. Be sure to read through our tutorial “Template and Location Set-up Tips“. If you want guardians to select where they will be while their child is checked in, you can create your master list of guardian check-in locations as well. Click the Add New Location or Age Group button, and be sure to change the location type to “Guardian Check-in Location”.